Everything you need to know to get ready and excited for Contagious GO East this summer. Scroll down to find out important information, including arrival details, packing list and what to expect on the first day. Contagious GO East runs from Saturday 17th August to Friday 23rd August 2019. By Car, please aim to arrive from 2.00pm on SATURDAY 17th August. Can we please stress that it is important NOT to arrive earlier than this as rooms will not be available and leaders will not be able to supervise young people before this time. There are parking spaces on site for those coming by car. Once at the venue, our team will direct you to ‘Registration’. By Train, If you are travelling by train, PLEASE NOTE we are no longer able to offer a shuttle service from the station to the venue due to the recently introduced Package Travel Regulations. If you are arriving by train (nearest station is Ipswich), you will need to arrange your own taxi service to the venue. When you arrive, we will register you and you will be introduced to your small group leader (called a ‘SUS’ group). If parents have any questions we are ready to chat with you too. You will be taken by your leader and shown your room and also given a short tour of the school where we are staying. You will quickly meet other young people and will make some good lasting friendships. 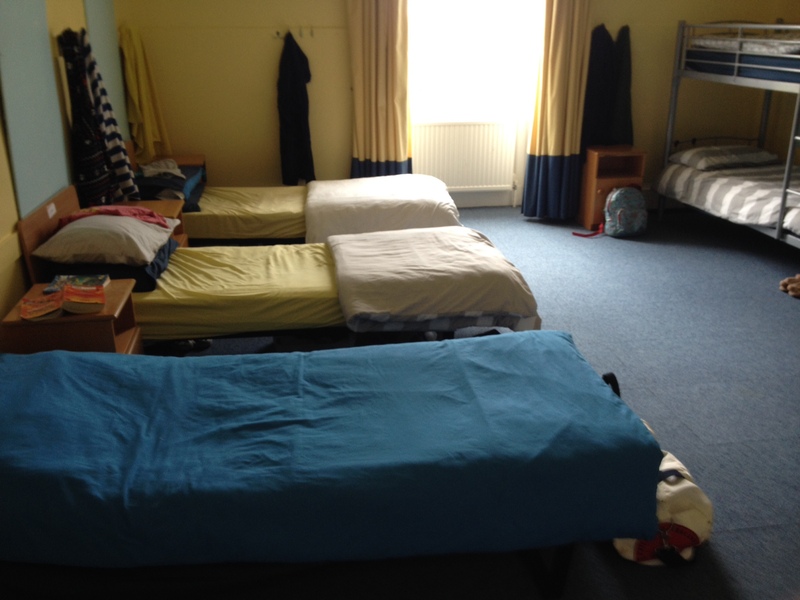 The young people will sleep in comfortable small dormitories with bathrooms within easy access. They will be with their SUS group and their leader will be in a separate room nearby. We will do our best to accommodate your rooming requests where possible. All bedding is provided but please bring a towel. into good hangout places for the young people, with games and a table tennis table. Leaders will always be nearby to chat to and facilitate the fun and games. The food is good at the School, prepared by the OPS kitchen team and with a good variety of tasty meals throughout the week. The meal times are 8:30am breakfast, 1pm Lunch, and 6pm dinner. Anyone with specific dietary requirements will be catered for, but it is very important that you notify us before the week via the booking form or emailing Lisa Wheatley regarding your requirements. We are hoping to take some general photos or video during the week that may be used for publicity, uploaded on our website or shared on social media sites. We hope to upload any photos on the public ‘Contagious’ Facebook group, so we encourage everyone to join our group. It is almost impossible to control the use of social media by young people at Contagious. If you have particular concerns about social media, photographs or publicity, please inform the Contagious Team on 01582 855898. All the above information should now have been completed via the online form. If you have not completed this form, please do so immediately or email the admin office. If there is any up to date information or change of circumstances, recent medication or pastoral concerns that were not included on the form, please provide written details to Wendy Pearson at the point of registration when you arrive. If you would like to discuss a medical condition/special needs then please contact the Contagious Team on 01582 855898 before 16th July 2019. Parents are asked to collect their children on the last day at 12 noon-12.30pm (GO Children will be given a packed lunch but please bring your own picnic). If you have young people at MAX East that will give you time to collect them at 1pm. I’m sure we will have no issues, but we would like to remind you of the Booking Terms & Conditions that you agreed to when booking online; this will ensure that you are aware of what behaviour is expected during the week. Spending Money: There is a small tuck shop that also sells books, so you may like to bring some spending money, though this is not essential. Any money you bring will be your own responsibility to look after and manage. Contagious Exalt: We want to encourage young people to use their talents for God, so we will host an evening called ‘Exalt’ where young people will join together to worship Jesus with their gifts. So if your talent is music, art, drama, comedy, dance, juggling, producing videos, photography, or WHATEVER, you’ll have an opportunity throughout the week to put something together and to rehearse. If you want to bring along your instrument, or camera, or anything else you are very welcome, however, they will remain your responsibility, and Contagious can take no responsibility for any loss or damage during the conference. Suitable Clothes: We have a full programme of activities including sports, messy games, crafts, dancing, creative projects and team challenges. Please bring a range of clothes and footwear for outdoors, indoors, muddy and wet environments or casual clothes for the evenings. We are trusting that the weather will be good for us to be outside for most of the week, but please be prepared for changeable conditions. Bible (New International Version) NOT electronic Bibles on phones etc. Supply of any medication needed plus any up to date information written down. Clothes suitable for all weathers! Mobile phone and charger (optional) NOTE: phones and devices will be collected in by leaders each night-time. We teach the Bible in several ways in order to help young people with a variety of learning styles, these include SUS groups, discussions, question times, talks and other enjoyable activities. SUS groups SUS (Scripture Under Scrutiny) groups are your small groups for the week that meet each morning after breakfast. This is the group of young people you will spend most time with and with who you will make new friends. If you do not know anyone, you will quickly be included in this new group of friends. You will have two or three adult leaders assigned to your SUS group who will care for you, give support and encouragement and teach you great truths from the Bible throughout your week at Contagious. Meetings We will have two meetings, one in the morning before SUS, and one in the evening. The whole group come together and sit in SUS teams, with leaders nearby to help. The sessions are so full of great stuff including… leader challenges, testimonies, stories, great songs, memory verse songs, answers to tough questions, team games, videos, drama, and great talks. This year we are digging deep into the book of Acts under the title Mission Unstoppable. 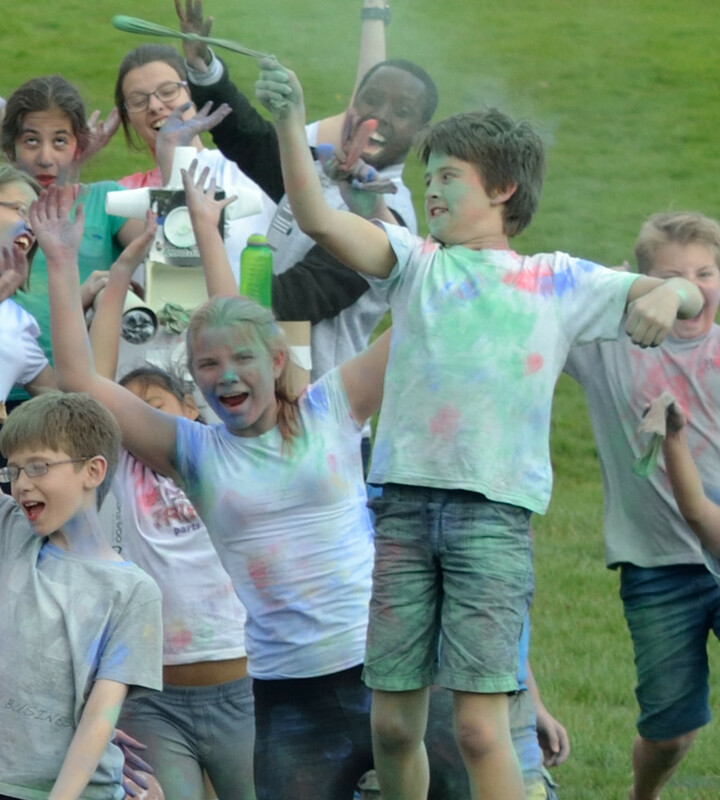 ‘All in’ activities – great fun team events where everyone enjoys being together. Optional activities – where we can choose from 4 or 5 options including sport, craft, Exalt rehearsals or alternative choices. On arrival, you will be given a full list of activities and options in your own programme booklets. Inflatables – On one fun afternoon we hire several inflatables. 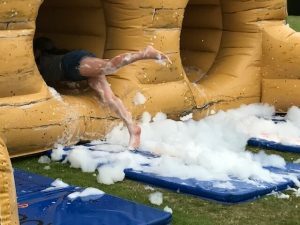 This year we are looking forward to a ‘Round the World It’s a Knockout’! Thank God for the many young people coming to Contagious from different backgrounds and churches. Thank God for Contagious and the dedicated leaders who prepare the teaching, organise the activities, and give of their time to care and support the young people. Please pray for young people who may be feeling anxious about coming to Contagious; pray that they would quickly find their way around, meet great leaders and make new friends. 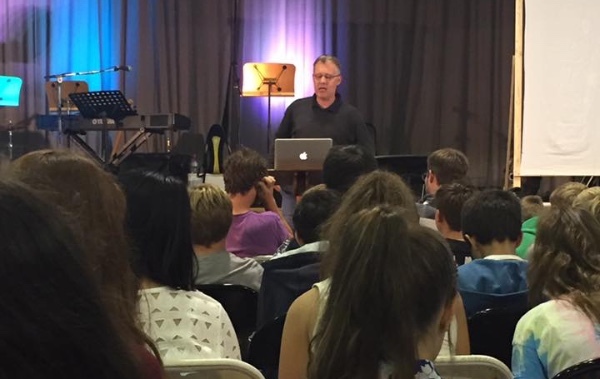 Please pray for young people as they listen, learn and engage with the teaching this summer; that they would grow in their love of Jesus and mature in their walk with Him. Please pray for the leaders that they would teach the young people well and faithfully, according to the Bible. Give them creative ideas to engage the young people and a love for the young people that comes from Jesus. Please pray for safety and smooth running of the conference, free from evil attack and blessed by God. Please pray for the ongoing work of Contagious as they plan future conferences and look for new opportunities to serve young people in our nation. Please subscribe to our PrayerMate feed where you will get regular prayer requests sent direct to your prayer list. In the event of an emergency please contact Tom on 07780523422 or Lisa on 07799398481.